As soon as I ventured out of the city and began bumping across the level, otherworldly steppes of Mongolia, in fact, I realized that nothing I’d seen in 40 years of traveling across Asia could compare with its great, heart-clearing stillness. Within 30 minutes of the hyper-malls, herders will welcome you into their gers to share a feast of marmots, roasted sheep and freshly boiled goats’ heads, much as they might have done in the time of Genghis Khan, the warrior who masterminded the Mongol Empire in the 13th century. If the horsemen who rode all the way to Europe to extend that empire were to return to their ancestral spaces next week, they’d feel right at home. Mongolia haunts a visitor as few other destinations can. After I’d returned home, the power of stepping out of my luxury ger in the Gobi to be met by a 74 million–year-old volcanic outcropping, the eeriness of knowing that dinosaur bones were all around, had gotten inside of me, like a shared dream I couldn’t shake. In a world flooded with distractions, Mongolia returns one to something ancestral. The clock has little meaning here. Days turn into an ageless cycle of random moments, scanning of the heavens, simple meals, long journeys. Often I didn’t know whether I was traveling into the past or the future. I could simply tell that this was a place that everybody would recognize, if only because it’s somewhere lost inside most of us, lodged like the people we once were and might one day again become. Photo: Frederic LaGrange – “Still Waters.” A full moon rises over a pond near Buir Lake in eastern Mongolia, near the Chinese border. 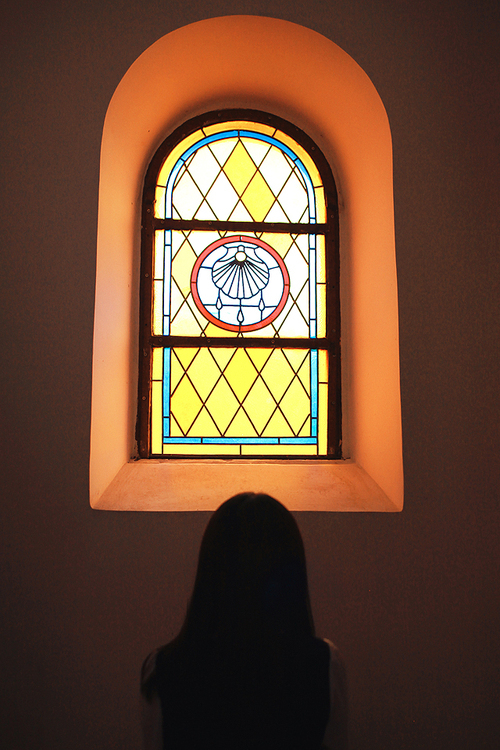 Perhaps we wouldn’t need chapels if our lives were already clear and calm (a saint or a Jesus may never need to go into a church; he’s always carrying one inside himself). Chapels are emergency rooms for the soul. They are the one place we can reliably go to find who we are and what we should be doing with our own lives—usually by finding all we aren’t, and what is much greater than us, to which we can only give ourselves up. Some keep the Sabbath going to Church. I keep it, staying at Home.